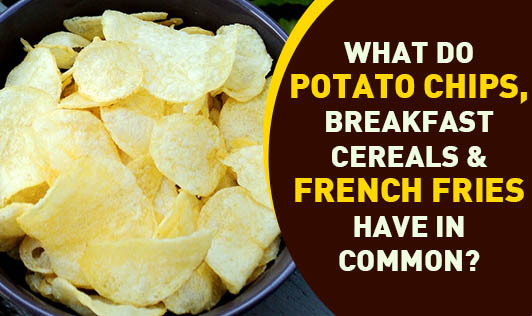 What Do Potato Chips, Breakfast Cereals & French Fries Have In Common? You have constantly heard that potato chips and french fries are high in fat and should be eaten in limits, but breakfast cereals are healthy and can be eaten regularly. Yet, they have something in common. Can you guess what that is? Acrylamide. This is a chemical which is formed in foods that are fried, baked or processed at high temperatures, or cooked for a long time. Apparently boiled foods and raw foods do not contain acrylamide. Currently there is very little information on how this chemical is formed during the baking process. The highest levels of the chemical has been found in potato and cereal products. According to current knowledge, acrylamide is formed when cooking temperatures of certain starchy foods cross 120 deg C.
Long term exposure to acrylamide is known to cause cancer in animals and can be toxic to the nervous system in high doses. But in human beings, more research is needed to find the safe limits. Apart from foods, cigarette smoking is a major source of acrylamide. So, here's one more reason to quit smoking!